The feedback on the Big Canal Roach video has been very encouraging. So much so that we're about to set-out on the next escapade, but, before so doing, I must right a wrong. ~ First and foremost - no product placement (even though my compadre is irritated in the extreme that we consequently did not state the hook or bread makes!). ~ If the quality we sought couldn't be achieved, or it seemed insufficiently engaging to us and our Guinea pigs, we wouldn't proceed. It would be an ordinary angler, going fishing. What doesn't come across in the film, because it is primarily about the quality of roach to be found in predator-affected canals, is where the inspiration came from to pursue this ongoing venture chasing pound plus fish, and that must be put right immediately. 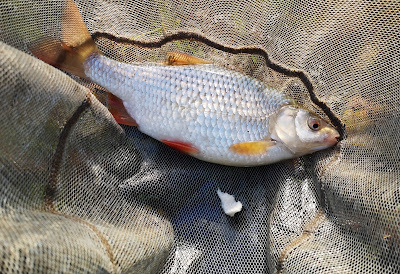 Long suffering readers of The Flannel will know that, without any doubt the most accomplished and inventive coarse angling blogger yet, Jeff Hatt, was the first to prophesise that local zander affected canals were capable of producing roach of 2lbs. This claim would seem wild and fanciful were it not for the fact that Jeff, his blogging keyboard and glow-tip floats now hung-up for the foreseeable future, could back it up with hard evidence of fish snared in the depths of winter at just a fraction below the magical weight. We made contact and started to collaborate to the point at which we shared an online spreadsheet populated with our big roach catches to see whether, over time, any unforeseen patterns might emerge. Sadly, not too long after this, Jeff lost the urge after life got in the way of his fishing, although his blog is thankfully still there as a resource of wise words for the angler looking to make sense of a situation. For me though this brief meeting of minds has been unquantifiable in its importance, with the basis of the method we depict and describe coming from Jeff's inspirational words. It was he who re-resurrected the lift bite method Fred J Taylor had already previously brought to prominence from even older sources in more classic situations, including pursuit of Estate Lake tench, and applied it to canals at a time when match anglers were still reeling from their decline due to the advent of a lack of small fish and continuing growth only of the relatively few fish remaining. Coupled with that favourite chalk stream specimen roach bait, bread flake, it proved an unbeatable combination that was and continues to be the best big roach method due to its crudity making it counterintuitively supersensitive. When Jeff's writing via the Idlers Quest portal first influenced my thinking I had caught 4 or 5 one pound plus roach from canals, all pre-1995. I'd returned to angling around 2011 with no purpose and no goal. I was going through the motions of fishing in a match style without the matches and it was inevitable that this was unlikely to be sufficiently enthralling to keep me active in the process. The experimentation with Jeff's technique was instantly successful with two roach of a pound and a three pound bream all falling to its temptations on the first brief trip attempting a similar approach on the pole. Over the following years, subsequently ploughing a lone gongoozling furrow, the method and, particularly, the feeding and hookbait size has been, dare I use the word, refined and various little alternatives have come and gone or occasionally become part of the arsenal of choices to suit circumstances. However, one thing has remained constant and that is Jeff's influence. I think it's fair to say that barely a session goes by without me thinking back to that collaboration for one reason or another and it's sad to think that what exists may be its whole backcatalogue, but, as I always feel, be it in respect of otters or whatever, we must embrace the change and take on those new challenges with an open mind. Of course I'm not the only one who wishes Jeff hadn't retired from the angle and it's, never so eloquently, written word at his apparent peak but he's in fine company in taking that route with sportsmen like Lennox Lewis, Nico Rosberg and Pete Sampras all choosing that option as champions in their own fields. So, yes, the film wouldn't have been made at all without Jeff's influence and, as I said to him only yesterday, had he still been active we would undoubtedly have contemplated discussing the prospect of producing a video on this subject with Eric together. Your video stands as a fine tribute to Jeff. Maybe the mantle of writing an eloquent and innovative blog has been passed over to you. Ooh blimey. No pressure then Steve! Seriously, I could never get near Jeff's level. I'm not sure anyone could. So much research and clever use of language...beyond anyone else I've read, but, maybe, like Fawlty Towers, it's best to leave a body of work untainted by loss of unique subject matter as time passes? I'm just kidding myself here really...I'd much prefer Idlers Quest to be in production! George I still visit his blog to see if it has come to life. However yours is equally interesting and some of your descriptions have been Hattesque in their detail. Keep up the excellent work. I wonder if Jeff’s book will ever see the light of day ? Firstly George, the no product placement stance stuck out a mile compared to most stuff put out these days, keep it up ! Very refreshing. Secondly, great acknowledgement of Jeffs work. Funny you should say that. I was only last night taping over the names on a reel ready for this weekend! Yes it was only right that Jeff should be credited. The method may have evolved a bit since then but without his pioneering use of the method for this purpose we'd be nowhere.